Create an AccountPSSST! WHOLESALE PRICES! These Lovely Silver Rose Butterfly Studs have Pretty 2mm round Rose CZ Crystals set in a Butterfly Surround. They are 6mm & have a nice very high polish so look great, BEST SELLER. Pretty Rose Butterfly Studs made with Rose CZ Crystals. 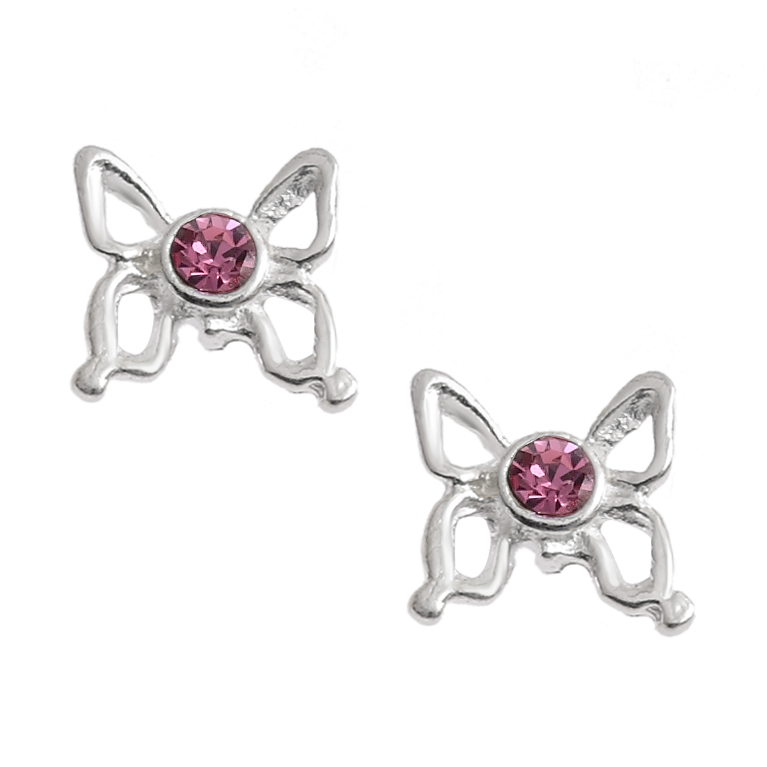 These Sterling Silver Pretty Rose Butterfly Studs have Pretty 2mm round Rose CZ Crystals set in a Butterfly Surround. They are 6mm & have a nice very high polish so look great, BEST SELLER. This website is strictly for approved Wholesale customers only, if you are looking to buy these Pretty Rose Butterfly Studs from a retail store, please visit Shooting Star. Welcome to our brand new on-line show case, its an Aladdin’s Cave of exciting 925 Silver & 925 Silver Gemstone Jewellery at very affordable prices to entice both new and your existing Customers. We are a small family business. We already had a retail shop but found we were unable to source new designs to meet our customer demands. So a few years ago we started to design our own Jewellery. It was very well received and we found we had a great product that lots of shops wanted to stock. At this point we launched our Wholesale Business. Once a year we travel across the world to select our Crystals and sort out all our new designs for the year. This means we always have fresh and exciting new stock. We use only the Best Quality Crystals with Lovely Silver Work so we are able to provide you with only the best quality products at very affordable prices. All our Crystals are hand picked, this and the fine polish ensures each of our pieces are of the same great quality. So Our products Simply Sell Themselves! We have a vast range of Silver and Gemstone Silver Jewellery . We also have a brand new ‘Boxed to Go’ range! Simply open the boxes and put them on your shelves, and they ready to sell. We are very proud of our range and we hope you love them just as much as we do! If you have any questions about any of our items, please get in touch. Register for a free account today to view our prices and exclusive offers. New customers get 10% off your first purchase. A Lovely Dainty Pentacle Pendant. This Dainty Pentacle Pendant is a nice heavier weight pendant and it is approx 2 1/4cm including Loop. A Lovely Dainty Ankh Silver Necklace. The Ankh is also know as The Breath Of Life / The Key Of Life. This Ankh Necklace is approx 2cm incl Loop and has a pretty 18 inch dainty cable chain. Best Seller! Nice silver hand made Amethyst Oval Ring. This Amethyst Oval Ring has a Pretty 12mm x 14mm oval cabochon which is set in a lovely silver surround which really shows off the beauty of the crystal. It is a reasonably large yet light weight and it comes in sizes: Small (Size 6 / L/M) Medium (Size 7 / N/O) Large (Size 8 / P/Q) & X Large (Size 9 / R/S) BEST SELLER! Lovely Silver Celtic Cross Necklace. This Celtic Cross Necklace has beautiful detail and the Celtic Cross is approx 2 1/2cm incl bale. This Celtic Cross Necklace comes with a pretty 18 inch Dainty Cable Chain. Best Seller! Hand Made Labradorite Large Goddess Earrings. These Stunning Silver Labradorite Large Goddess Earrings are made in a nice heavier weight design. Beautiful silver work surround with Pretty 5mm Round Labradorite Cabochons set at the top & 10mm x 14mm Inverted Teardrop Labradorite Cabochons set below joined with a lovely silver crescent moon. Approx length 4 1/4cm excl the hooks. Pretty Faceted Blue Topaz Knot Pendant. This is a lovely silver hand made Blue Topaz Knot Pendant. It has a stunning 14mm x 10mm Oval faceted blue topaz cab which has been set in a beautiful celtic knot design and finished with a pretty bale. It is just over 4cm long incl bale by just under 1 1/2cm wide. Stunning Silver Flying Witch Necklace. It is Double Sided / 3d in a nice Sturdy Weight. The Detail on the witch is Great, The Witch with her Lovely Hat has her legs Astride her Broomstick. She is Just over 2 1/4cm incl Bale. Comes complete with a dainty cable chain. Flying Witch Earrings are also in stock. Comes with a beautiful 18" Cable Chain. This Flying Witch Necklace is a BEST SELLER! Matching Flying Witch Earrings are also in stock. A Really Nice Dainty Silver Seahorse Necklace. The Seahorse Necklace has a Pretty 18" Cable Chain. The Seahorse has Lovely Double Sided Detail and is approx 2 1/2 cm including Bale. This is a BEST SELLER! A Really Beautiful Dainty Sterling Silver Seahorse Necklace. The Seahorse has Lovely Detail and is approx 2 1/2 cm including Bale. Comes with a Pretty 18 inch Cable Chain. This is a BEST SELLER! © Silver Jewellery Cavern Wholesale Ltd. 2018. All Rights Reserved.